APR is pleased to present the 2.0 TSI EA888 Gen 1 K04 Turbocharger System! The APR K04 Turbocharger System features many upgrades over the 2.0T’s factory equipped IHI turbocharger, making it an excellent upgrade. The integrated turbofold design features a cast stainless steel exhaust manifold and turbine housing, integrated into one single unit. This design aids in turbocharger spool while the stainless steel construction is capable of withstanding higher exhaust gas temperature for longer periods of time than lesser materials, such as cast iron. The CNC-machined, billet aluminum compressor wheel and higher flow exhaust turbine wheel expand the turbo’s efficiency range, allowing for higher output across a wider RPM range. True to APR’s mantra of Performance without Compromise the days of shredding tires on front wheel drive vehicles are rapidly disappearing thanks to the new Gold Standard in ECU torque management calibration strategies only APR can deliver. Compressor surge is avoided to increase the reliability of the system without limiting the area under the curve typically experienced during a top speed acceleration run. APR’s endless pursuit of perfection has resulted in the most comprehensive 2.0 TSI K04 turbocharger system and tuning package in the world. Using 93-octane fuel, the APR K04 Turbocharger System produces an astonishing 360 horsepower and 382 ft-lbs of torque. Unlike the factory turbocharger, power stays strong and doesn’t dramatically taper towards the vehicle’s new 7,100 RPM redline. Switching to APR’s 100 octane race fuel mode, peak power and torque climb further to 375 horsepower and 408 ft-lbs of torque. APR’s calibration experts have safely maximized the full power potential of the turbocharger unit, while keeping reliability at the forefront of their calibration strategies. To learn about the other parts included in the APR K04 Turbocharger System, and the advanced engine management which makes it all possible, click the thumbnails for a larger image and full technical details. At the heart of the K04 Turbocharger System is an APR proprietary customized version of the factory Borg Warner K04-64 turbocharger originally equipped on VAG’s high-output models, such as the Golf R and S3. The turbocharger features a CNC-machined, billet compressor wheel and stainless steel exhaust turbofold. Each turbocharger unit is machined, assembled and clocked in house at APR with the necessary brackets to ensure proper wastegate fitment and orientation. Each wastegate is then calibrated for precise operation and control to ensure seamless integration with the expertly recalibrated OEM engine management system. One of the greatest benefits to the APR K04 turbocharger system is its simple, yet elegant design. APR's CNC-machined direct compressor recirculation port on the OEM compressor cover significantly reduces engine bay clutter and saves the end user from the hidden costs of purchasing extra throttle body pipes, hoses, clamps and DV mounts for recirculating boost pressure. The compact design also removes extra charge piping volume to allow for faster boost response and less locations for boost leaks. Furthermore, charge air pressure is directed directly at the compressor wheel which helps keep the turbo spooled upon lifting the throttle, minimizing turbo lag. The OEM k04 turbocharger features a turbo muffler designed to reduce turbocharger sound, but does so at the cost of ultimate performance. 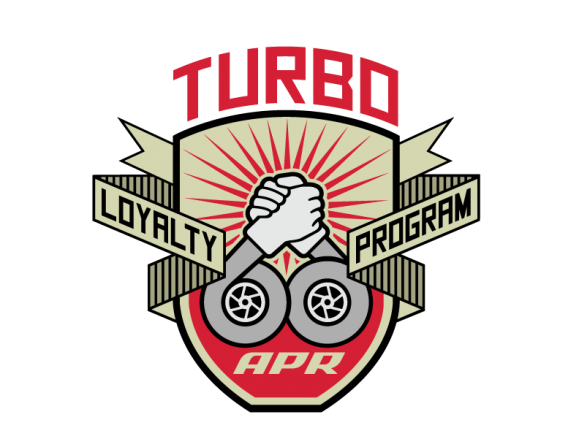 APR removes the turbo muffler not only to enhance the sound of the turbocharger, but to also provide a smooth airflow path across the previously baffled muffler section. A clean and simple CNC flange developed by APR's Mechanical Engineers is bolted directly to the compressor cover in place of the OEM turbo muffler. A long mounting surface provides an excellent slip-proof surface for mounting the included APR EZ-Flow silicone discharge hose and an o-ring between the flanges ensures a life of leak-proof operation. The K04 turbocharger was originally designed for an EA113 2.0T engine, and as such, includes items not present on the EA888 2.0T engine. The compressor cover features a port used in the EA113’s PCV system, but on the EA888’s this same port is located higher up on the intake tubing. APR has provided a gasket-sealed laser-cut port cover to block off this part to ensure no unmetered air enters into the system. The design is clean and simple and never requires maintenance. With the significant amount of changes included in the APR K04 Turbocharger System, APR’s Engineers spent months calibrating the engine management system, including hundreds of hours of in-house chassis dyno development. Drivability, gear changes, cruising and part throttle operation were tuned to operate smoothly as if intended by the OEM through proper torque management. Further development was performed putting the vehicle through performance evaluation and durability testing at the drag strip and road course. APR’s Electrical Engineers built new coding functions, strategies and routines into the ECU to control conditions normally unseen at factory power levels. Thanks to APR’s incredible proprietary calibration suite, data logging software and full access to the coding structure of the ECU, appropriate and intelligent changes are made to ensure flawless drivability and excellent performance without compromise. APR’s Calibration Engineers restructured the engine’s volumetric efficiency (VE) model to correctly determine the ECU’s calculated load and deliver proper torque management. Thanks to APR’s patented boost control coding and the addition of a 3-Bar MAP sensor, the ECU is able to perform closed loop boost control well beyond relatively low limits dictated by the factory MAP sensor. This directly translates to safer and more predictable operation while additionally producing more power and torque across the entire power band. Additionally, through the properly reconstructed VE model, accurate open loop fueling is achieved, translating to insignificant fuel trim adjustments. Closed loop fueling is calibrated to control lambda perfectly under all operating conditions. Furthermore, compensations, such as ones related to intake air temperature, exhaust temperature, and altitude, are adjusted to handle the larger variances compared to the factory, low-output setup. APR’s Calibration Engineers have optimized cam timing, ignition timing, engine load and lambda to provide tremendous leaps in power while retaining the OEM knock control strategy. The result is safely achieved power, optimized for various fuel grades found around the world from low-quality pump fuel, all the way to high-quality, oxygenated race fuels. To aid in turbocharger reliability and longevity, APR’s engineers carefully studied the turbocharger’s compressor maps to avoid regions where compressor surge may be experienced. The K04 turbocharger has fantastic response characteristics and is able to produce incredibly high pressure at low airflow levels, but in doing so, the turbocharger runs into issues of compressor surge. In the area between 3000-4000 RPM, APR’s Calibration Experts have elected to limit boost pressure. During testing, with the limits removed, APR’s engineers were able to easily achieve over 400 ft-lbs of torque with 93 octane fuel, but doing so could result in damaging the turbo’s reliability. Back-to-back testing was conducted with and without the limitation and despite the reduction in torque in this range, APR’s engineers were unable to record a measureable difference in accelerative performance. Torque management plays a big role in how the vehicle feels and performs, especially during moments of low gear, rapid acceleration. Typically front wheel drive vehicles suffer from excessive wheel spin during these moments due to the massive torque on tap from the K04 Turbocharger System. Some drivers can find themselves in situations where they are fighting against wheel spin and traction control when they are simply interested in going forward as quickly as possible. This is further compounded by the fact that the factory traction control (ASR) system was designed for vehicles producing far less power and torque, resulting in overcompensated ASR interventions. APR’s Calibration Engineers set out to perfect torque management and traction control by minimizing wheel spin as much as possible without neutering the driving experience. A multi-step approach was taken to achieve appropriate control. With ASR enabled, forward movement wheel spin will trigger appropriate torque intervention levels to minimize spin without hurting forward acceleration. On top of this, the torque management system is fine tuned to deliver only as much torque as the tires can take. In normal conditions the tires will only slightly break loose under full acceleration, resulting maximum acceleration. In higher traction situations, or with ASR disabled, all of the system’s torque is directly on tap! Beyond wide-open throttle performance, APR’s Calibration Engineers spent countless hours optimizing vehicle drivability under daily, part-throttle, driving. The vehicle fully retains its impressive daily driver status and simply has more power on tap should the driver request more with his or her right foot! APR’s EMCS program-switching technology and APR Mobile put control of the ECU in the operator's hand to access modes for standard pump fuel, high-output race fuel and even reduced-output valet modes to protect the vehicle against improper use by other individuals. This technology is patented by APR and is found nowhere else in the world. It’s Performance Without Compromise only APR can deliver! To provide closed-loop boost control at absolute pressure levels above 2.5 bar, APR’s K04 Turbocharger System features an OEM Bosch 3 bar MAP sensor. APR’s electrical engineers went many steps beyond the norm and recoded the factory ECU to deliver closed-loop boost control up to 3-bar absolute. This ability, combined with proper torque management, results in safe, reliable, and predictable performance at higher power levels without the need for clumsy and archaic external boost controlling devices. A wire-reinforced, multi-ply silicone hose provide an unrestricted path for airflow exiting the turbocharger. The hose is engineered to properly connect the turbo’s outlet to the factory charge piping system. Horsepower and torque were measured in APR’s in-house, Soundmaster dyno cell, using a Dynapack all-wheel dynamometer. Multiple stock and modified runs were conducted and the SAEJ1349 corrected results were averaged together to represent the differences between a stock and APR K04 2.0 TSI. Crank power figures were estimated based on VAG’s factory advertised results. APR's software is designed to utilize the factory mass airflow (MAF) sensor and housing. The APR Intake System is highly recommended and required to meet the advertised power output. The APR Race DP Exhaust System (FWD) or APR Race DP Exhaust System (AWD) is required. The APR Intercooler System is required to meet the advertised power figures. The APR K04 Turbocharger System greatly increases torque over the factory output levels and as such, an upgraded clutch may be necessary to transmit power to the ground. APR highly recommends upgrading the factory clutch to one that suits the operator's intended driving style. APR has discovered some engines experience exhaust valve float at high RPM at the advertised horsepower levels due to excessive exhaust backpressure caused by K04’s relatively small turbine wheel. In such cases, APR recommends upgrading the factory valve springs. However, upon request, lower output software capable of producing 321 horsepower and 310 ft-lbs of torque on 93 octane is available. APR's software is designed for use with NGK BKR8EIX spark plugs gapped to 0.024" ±0.002" or 0.6mm ±0.05mm with a change interval of 10-15,000 mi or 16-24,000 km. APR recommends Michelin PSS and PS2 tires as well as BFGoodrich Rivals and GForce Sport Comp 2 tires. APR recommends Motul Fluids and Lubricants. To ensure software is ready or available for each vehicles’ ECU box code and revision, please check with APR prior to scheduling appointments! - Program Switching: A fully loaded ECU includes up to 4 program modes (stock mode, performance modes, valet, etc), as well as fault code erase, security lockout and anti-theft depending on availability and ECU compatibility.